Pro Driving school is proud to be one of the largest reputable successful, company that has been serving Kitchener - Waterloo since 2010. 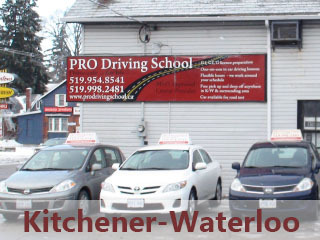 Are you looking for a driving school in Kitchener-Waterloo area? Are you a student in Waterloo looking for a driving school? Pro Driving School is the answer. We provide the best driving education in Kitchener-Waterloo area. We are taking pride for the high rates of our graduates on the road and a high success rates of passing their road tests first time. In a city filled with so many choices, we thank you for choosing us!! Pro Driving School is a Ministry - Approved Beginner Driving Education Course Provider. We provide superior driver training, currently 7 instructors to serve you. Our instructors are highly trained and kept up-to-date on traffic laws, regulations and by-law governing Ontario licensing system. All in-car lessons are private, no more than one student in the car. The instructors are always on time. Fun and interactive classroom instructions. At PRO DRIVING SCHOOL we believe that everyone should be taught defensive driving for an affordable price. It’s a great balance of price and quality. You don’t only pay for an official certification, but primarily for professionally trained and competent instructors – we guarantee professionalism. We are confident that you will be pleased with our service and recommend us to other family members and friends. Classroom and in-car training are taught by professional, helpful, and patient male and female instructors. On the road the lessons are conducted in fully insured cars equipped with: a driving school roof sign, driver instructor licence plate, dual mirrors and a dual braking system to ensure your personal safety. You have the opportunity to take the practical examination with the same vehicle in which you were trained. At Pro Driving School we are very proud of our highest success rate. Not only that, but also our students pass their road test with a high score. Free pick-up and drop off anywhere in Kitchener-Waterloo. All instructors have a clear Criminal background check. Not sure if we cover your area? Due to popular demand we are expanding all the time and covering more areas. Contact us to see if we have an instructor near you.